Are you Fit for Fives? 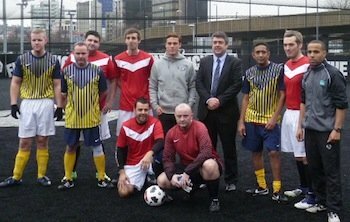 Spurs and England star Scott Parker has launched the Lucozade Powerleague Fit for Fives programme promoting the unique health benefits of 5-a-side football. Powerleague, the largest operator of premium 5-a-side football centres in Europe, have a flagship Wembley facility at which the launch took place. Scott Parker said: '5-a-side is an integral part of every footballer’s development, from Saturday morning kick-abouts with your mates, to professional training with Spurs and England. MHF CEO Peter Baker spoke at the launch. 'We're delighted to back Powerleague's Fit for Fives. Football is good for men's health in many ways. Watching matches can be cathartic, discussing football can bring men closer, football clubs can engage men in health in a way the NHS can't, and of course playing football provides an excellent cardiovascular and strength-building workout. And it's good fun. Five-a-side football provides a fun and engaging way of being more physically active for players of all abilities and age ranges: cheaper than gym membership, extremely sociable and, done properly, a good healthy work-out. Powerleague cite a series of studies from the University of Copenhagen showing that playing football is better for your health than going for a run or lifting weights. Furthermore, they say, 5-a-side is more beneficial than a full 11-a-side game, as it ensures that all players get a workout. The intensity and range of movements involved in the game, including kicks, twists, turns and sprints, provide excellent overall exercise. It can help cut the risk of heart disease, by reducing blood pressure and cholesterol levels, and is also a good way to lose weight, according to the studies by 50 researchers in seven countries. One of the studies asked 47 men with high blood pressure to play football or to run for an hour twice a week for three months. Those playing the game saw their blood pressure fall by an average of twice as much as those in the running group. Both groups lost similar amounts of weight but cholesterol levels fell among the footballers, an effect not seen in the running group. Other studies found that football increased bone density twice as much as running. Nigel Hargreaves of Powerleague said: 'This research backs up our long held belief that the health benefits of playing regular 5-a-side football are superb. I can vouch for this myself, as I regularly play with friends and colleagues. It’s a great way to keep fit and socialise with friends.